Emily Davies, the daughter of Reverend John Davies and Mary Hopkinson, was born in Gateshead in 1830. John Davies held traditional views on education and whereas Emily's three brothers were sent away to boarding school, she was taught at home. Emily was very close to her older brother, John Llewelyn. His success at Cambridge University made her realize how she had been denied an equal opportunity to an academic education. In 1854 Emily met Elizabeth Garrett at the home of her friends, Jane and Emily Crow. Elizabeth introduced Emily to two other young feminists, Barbara Leigh Smith and Bessie Parkes. Emily provided important support to Elizabeth Garrett who had embarked on her attempt to become a doctor. For a while Emily considered the possibility of studying medicine herself, but eventually she decided that her poor early education made this impossible. Emily Davies now made the decision that she would dedicate the rest of her life helping other young women obtain the opportunities that had been denied to her. This included a desire that women should be admitted to higher education and the professions on equal terms with men. Emily's first campaign was to persuade the authorities to allow women to become students at London University. She also became involved in a campaign to secure the admission of girls to the Oxford and Cambridge examinations. In 1864 Emily had her first success when the Schools Enquiry Commission agreed to look into gender inequalities in education. To support her campaigns Emily wrote her book The Higher Education of Women. In 1865 Emily joined with her friends Elizabeth Garrett Anderson, Barbara Bodichon, Dorothea Beale and Francis Mary Buss to form a woman's discussion group called the Kensington Society. The following year the group formed the London Suffrage Committee and began organizing a petition asking Parliament to grant women the vote. Emily soon found herself in disagreement with most of the other members of the London Suffrage Committee. Members associated with the Radical Party, such as Barbara Bodichon and Helen Taylor, wanted votes for women on the same terms as men. Davies thought that they had more chance of success if they only asked for votes for unmarried women. After this dispute, Emily Davies did not play a prominent role in the suffrage campaign for the next twenty years. Instead she concentrated on the idea of founding a women's college. With the help of Barbara Bodichon and other feminists, Emily raised enough money to purchase Benslow, a house two miles outside Cambridge. In 1873 Benslow House was opened as Girton College. However, women students at Girton were not admitted to full membership of the University of Cambridge until April 1948. Emily's ideas on education were fairly conservative and this brought her into conflict with Barbara Bodichon. Emily believed that her students should concentrate on traditional subjects such as classics and mathematics whereas Bodichon favoured a more radical approach to the curriculum. The two women also disagreed on student discipline. Emily favoured a strict regime compared to Barbara's more liberal approach. Emily also insisted that the new college must be affiliated to the Church of England. In 1889 Emily returned to the struggle for the vote when she joined the committee of the London National Society for Women's Suffrage. Emily played an active role in the National Union of Suffrage Societies (NUWSS) but was totally opposed to the militant tactics of the suffragettes. Emily also had disagreements with the leadership of the NUWSS. Emily did not support the idea that all adults should have the vote and in 1912 she resigned when the organisation decided to give its full support to the Labour Party. Emily now joined the much smaller Conservative and Unionists Women's Franchise Society. In 1919 Davies was one of the very few early members of the first Women's Suffrage Society still left alive to record their vote in a Parliamentary election. Emily Davies died in 1921. 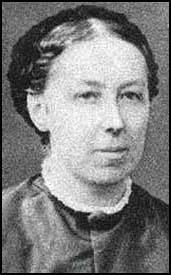 (1) Louisa Garrett Anderson, the daughter of Elizabeth Garrett, wrote about attitudes towards marriage when her mother was a young woman in the 1860s. Miss Davies' appearance was most misleading. She did not suggest personality or power. She seemed to be rather plain, rather dim little person with mouse-coloured hair and conventional manners. She was not even ugly. Never was there a more complex disguise than Providence provided for Emily Davies until in old age character and ability printed themselves on her face. (3) In 1859, the 23-year-old, Elizabeth Garrett, met Emily Davies when she was staying at Annie Crowe's house. Emily and Elizabeth became close friends. Emily told Elizabeth about how Elizabeth Blackwell had qualified as a doctor in the USA. With Emily's encouragement, Elizabeth decided that she would be a doctor. On 15 June 1860, Elizabeth wrote to Emily to tell her how her father had reacted to the news. At first he was very discouraging, to my astonishment then, but now I fancy he did it as a forlorn hope to check me; he said the whole idea was so disgusting that he could not entertain it for a moment. I asked what there was to make doctoring more disgusting than nursing, which women were always doing, and which ladies had done publicly in the Crimea. He could not tell me. When I felt rather overcome with his opposition, I said as firmly as I could, that I must have this or something else, that I could not live without some real work, and then he objected that it would take seven years before I could practise. I said if it were seven years I should then be little more than 31 years old and able to work for twenty years probably. I think he will probably come round in time, I mean to renew the subject pretty often. (4) Louisa Garrett used to tell a story of a scene she witnessed at Alde House, Aldeburgh. The three women were her two daughters, Elizabeth Garrett and Millicent Garrett, and their friend, Emily Davies. Before the bedroom fire, the girls were brushing their hair. Emily was twenty-nine, Elizabeth twenty-three and Millicent thirteen. As they brushed, they debated. 'Women can get nowhere', said Emily, 'unless they are as well educated as men. I shall open the universities.' 'Yes,' agreed Elizabeth. 'We need education but we need an income too and we can't earn that without training and a profession. I shall start women in medicine. But what shall we do with Milly?' They agreed that she should get the parliamentary vote for women. (5) In a book she wrote in 1939, Louise Garrett Anderson described how in 1859 a group of women under the leadership of Barbara Bodichon, began meeting at Langham Place in London. (6) In 1866 Barbara Bodichon, Emily Davies, Elizabeth Garrett and Dorothea Beale organised a petition in favour of women's suffrage. Louise Garrett Anderson explained what happened on the day the petition was presented to Parliament.
. Elizabeth Garrett liked to be ahead of time, so the delegation arrived early in the Great Hall, Westminster, she with the roll of parchment in her arms. It made a large parcel and she felt conspicuous. To avoid attracting attention she turned to the only woman who seemed, among the hurrying men, to be a permanent resident in that great shrine of memories, the apple-woman, who agreed to hide the precious scroll under her stand; but, learning what it was, insisted first on adding her signature, so the parcel had to be unrolled again. (7) The 1870 Education Act enabled women for the first time to vote and to stand for election to local School Boards. In 1870 four women stood as candidates. Flora Stevenson in Edinburgh, Lydia Becker in Manchester, Emily Davies in Greenwich and Elizabeth Garrett in Marylebone. Elizabeth Garrett wrote a letter on 24th October 1870, explaining how she became a candidate.
. I dare say when it has to be done I can do it, and it is no use asking for women to be taken into public work and yet to wish them to avoid publicity. Still I am very sorry it is necessary, especially as I can't think of anything to say for four speeches. The first of these trials is to be next week. It is a tough and toilsome business. (8) In her book Women's Suffrage published in 1911, Millicent Garrett Fawcett described the School Board elections in 1870. In the first School Board election, which took place in London in November 1870 Miss Elizabeth Garrett and Miss Emily Davies were returned as members. Miss Garrett was at the head of the poll in her constituency - Marylebone. She polled more than 47,000 votes, the largest number, it was said at the time, which had ever been bestowed upon any candidate in any election in England. In Manchester Miss Becker was elected a member of the first School Board, and was continuously re-elected for twenty years until her death in 1890. In Edinburgh Miss Flora Stevenson was elected to the first School Board, and was continuously re-elected for thirty-three years until her death in 1905.